ANZ has become the latest to take a dim view of the future of iron ore. The bank has cut its iron ore price forecast for the next two years, saying ever-growing low-cost supply and flat demand will not see the price leap back up anytime soon. 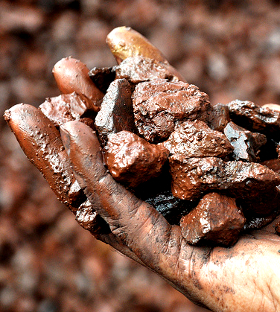 For the rest of 2015, ANZ expects the iron ore price to float around $US56 a tonne. The bank predicts iron ore will sell for an average $US55 a tonne in 2016, $US5 a tonne lower than its earlier predictions. In 2017, ANZ expects the price to rise to an average of $US60 a tonne, still down $US3 a tonne. Iron ore oversupply low demand from China pushed the price of iron ore to a record low of $US46.70 tonne at the beginning of April. Since then, the price has bounced-back slightly to around $US56 a tonne. Analsyst say this was due to announcements from two major producers – BHP Billiton and Vale – that they would cut output. ANZ’s head of commodity research Mark Pervan said the cuts would not restore the price entirely. “Despite this, we feel fundamentals still look weak. Steel prices have only shown a mildly positive response, and low-cost iron ore supply continues to expand,” Pervan said. “Fundamentals are still bruised by expanded low-cost supply and flat demand. Prime Minister Tony Abbott has revealed the full cost of the iron ore price drop to Federal coffers, which lost $30 billion in revenue over four years. “Since last year's budget, collapsing iron ore prices and the subsequent write-down in tax receipts have already driven a cut in government revenue of more than $30 billion over four years,” Abbott told a business lunch in Sydney last week.